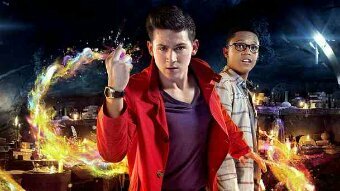 Russell T Davies CBBC Sci-fi adventure series, Wizards Vs Aliens has been re-commissioned for a third series. Created by Davies and Phil Ford (The Sarah Jane Adventures, Doctor Who), the fast-paced drama stars stars Scott Haran as wizard Tom Clarke and Percelle Ascott as his scientific friend Benny as they attempt to stop the Nekross, who are threatening to destroy all of wizardkind – and the Earth – in their pursuit of magic. Series three will be executive produced by Phil Ford and Nikki Wilson for BBC Wales and Sue Nott for CBBC. Wizards Vs Aliens is produced by BBC Cymru Wales, and will start production in April at the BBC’s Roath Lock Studios in Cardiff and on location around the area for transmission in 2014/15.